WUXI, CHINA - A newly announced innovation partnership between the U.S. Dairy Export Council and China’s Jiangnan University creates research and educational opportunities at one of China's most respected food science centers. VIDEO below, shot in China, outlines benefits of the new dairy partnership. Click arrow in above image to watch a video of less than 2 minutes. Over time, the relationship between the two organizations has the potential to connect the U.S. and Chinese dairy for years to come, laying the groundwork for increased U.S. exports to China while providing more safe, secure and sustainable choices for Chinese consumers. USDEC President and CEO Tom Vilsack said the March 30 signing of a memorandum of understanding (MOU) formalizing the partnership "indicates a long-term commitment to the Chinese market" by the U.S. dairy industry. Chinese news media gathered for the signing at Jiangnan University’s campus in Wuxi asked Vilsack what potential the U.S. dairy industry sees in China. Vilsack's answer looked years ahead to a mutually beneficial relationship based on the United States' abundant milk supply having the capacity to meet China's growing demand for protein. "China’s economy continues to grow." said Vilsack. "Its cities continue to get larger. Its middle class continues to expand. The number of Chinese children born continues to increase. There is going to be a great demand for protein in general and dairy protein in particular, everything from infant formula to health bars that contain whey protein and protein concentrate. "There is no question the United States' dairy industry will increase dairy production over time. That means we can be a consistent supplier to help match the growth of demand in the Chinese market. The products from the United States will continue to be safe and I think there will be a growing awareness of U.S. Dairy's commitment to sustainability." Jiangnan University Vice President Xu Yan expressed enthusiasm about the new relationship with USDEC. Addressing reporters, Vilsack pointed out that a strategy of diversification where China buys from multiple suppliers reduces risk and helps yield long-term dividends. "The benefit for China is creating choice and competition for Chinese consumers," said Vilsack. "You don’t want to be overly dependent on any one supplier of a product. Things can happen where production can be significantly reduced because of weather and other variables. By having multiple suppliers, you have multiple opportunities to get the best product at the best price." 1. Innovation: The development of China-friendly product formulations that incorporate U.S. dairy ingredients should inspire U.S. dairy suppliers to create new products and ingredients for the China market. "There are ways through research that whey, lactose, permeate and milk protein concentrates can be used in a wide variety of food applications to create something more delicious with more consistency," said Vilsack. 2. Engagement: USDEC and its member companies will have on-the-ground access to in-market facilities that should leverage U.S. dairy ingredient functionality, versatility and nutrition. "In the United States we have seen an expansion of online purchasing," Vilsack told reporters. There are a number of food companies that offer online sales of cheese and other dairy products. I’m sure they would be willing at some point in the future to ship to China. But first we have to establish an interest in and understanding of U.S. dairy products so people in China know they are available with an emphasis on quality, safety and sustainability." 3. Education: The partnership will enrich students’ academic experiences in Jiangnan University’s dairy science and technology programs with practical hands-on R&D skills using U.S. dairy to jumpstart careers upon graduation. USDEC and its members will also receive an education at the best location possible, in the market. "By getting closer to the customer we can build more continuity on the ground in China to develop products that serve our Chinese customers and ultimately Chinese consumers," said Ross Christieson, business unit director for North Asia, who attended the signing ceremony. The agreement follows a series of USDEC-led efforts aimed at building relationships in China and removing barriers to trade to level the playing field with competitors, including last year’s MOU on U.S. dairy plant registration and the unilateral reduction in Chinese cheese tariffs. The announcement of the dairy partnership garnered international news coverage, with The South China Morning Post, pointing out that it emerged "amid rising trade tensions between the world’s two largest economies." China announced on Monday that it was imposing new sanctions on 128 U.S. products in response to U.S. tariffs on imports of steel and aluminum from China. The current Chinese tariffs list does not include dairy. USDEC staff is closely monitoring the situation. 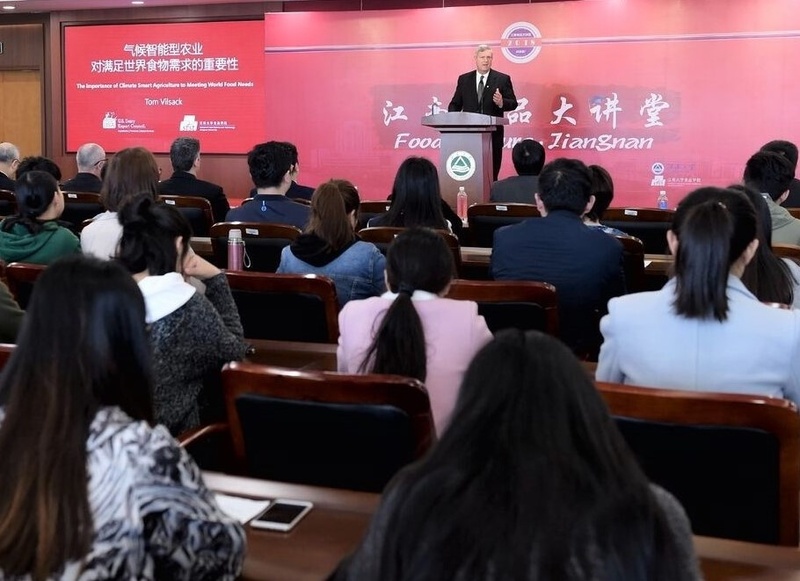 Underlining his focus on long-term, collaborative solutions, Vilsack addressed 150 food science majors at Jiangnan University. His presentation, “The Importance of Climate Smart Agriculture to Meeting World Food Needs,” explored the need for collaboration and innovation in tackling agricultural sustainability as the world’s resources grow increasingly strained. USDEC President and CEO Tom Vilsack addresses 150 food science majors at Jiangnan University in Wuxi, China. Mark O'Keefe is vice president of editorial services at USDEC.